Once upon a time the Rabbit dwelt in a lodge and lived with his Grandmother. Pa’hangadi, Manshtinge aka i’kanthinke ti’gthe e’nanxti zhu’gi’the a’biama. It was the Rabbit’s custom to go hunting very early in the morning. Ki, manshtinnge aka haangi’chixti, a’bae a’the nani’te. No matter how early in the morning he went, a person with very long feet had already been there leaving a trail. Haangi’chi’xti a’thai bi’daan, shanna niashinga wi, si snede, e’de’ganxti a’hi, bi’ama, si’gthe ke u’he ga’xa biama. The Rabbit wished to know him. Manshtinge aka i’ba’han ganthai te. “Now”, thought the Rabbit, “I will go ahead of this person”. Manshtinge i’chan e’thegan, “we pa’hanga bthe ta’mike”. The next morning, the Rabbit woke up early. He went to the place to try and see this person. Again it happened, the person had already been there leaving a trail. Shi’ e’ganxti, ni’a’shinga ka, e’de’ganxti, a’hi biama si’gthe ke, u’he ki’di danbai, te. “Why should you do that?” She said. “That person makes me angry.” He said. “Ni’a’shinga thin, itha’t’abthe a’biama, shi, a’thai’te. Once again, the footprints were there before he arrived. Shi’the’nan, si’gthe ke e’di te, danbabe inchan a’hi’ki. So, he rested and waited for night to come. Manshtinge aka anze’gi’tha’i, hante i’tha’pa’i’te. Then, he made a noose from a bow-string, placing it where the footprints had been seen. Ganki mandekan thi’za bi, bu’ta i’ka’shi ga’xa, u’heti’di i’nantha be si’gthe ke danbai te. The next morning, he arrived very early to check his trap. Haangi’chi’ki, a’hi te, u’ki’nanshke, than danbe a’hi te. His trap worked, he had caught the sun. U’ki’nan’shke than di, min than u’nan te! Surprised at his catch, he ran home as fast as he could to tell his Grandmother. Anwanxthidan inda’dan u’bthan i’tha’p’hanmanzhi, ti’te’ta tanthina’gthai. “Grandmother, I wanted to take my bow-string, but I was scared every time. “Kanha, mande’kan ke a’gthi’ze kanbtha, thanzhan anwanxthi nanman”. He got close to it with his knife, but was still scared. I’bi’ski a’hi nane’te, manhi a’gtha thin, shannan wa’xthi nante. 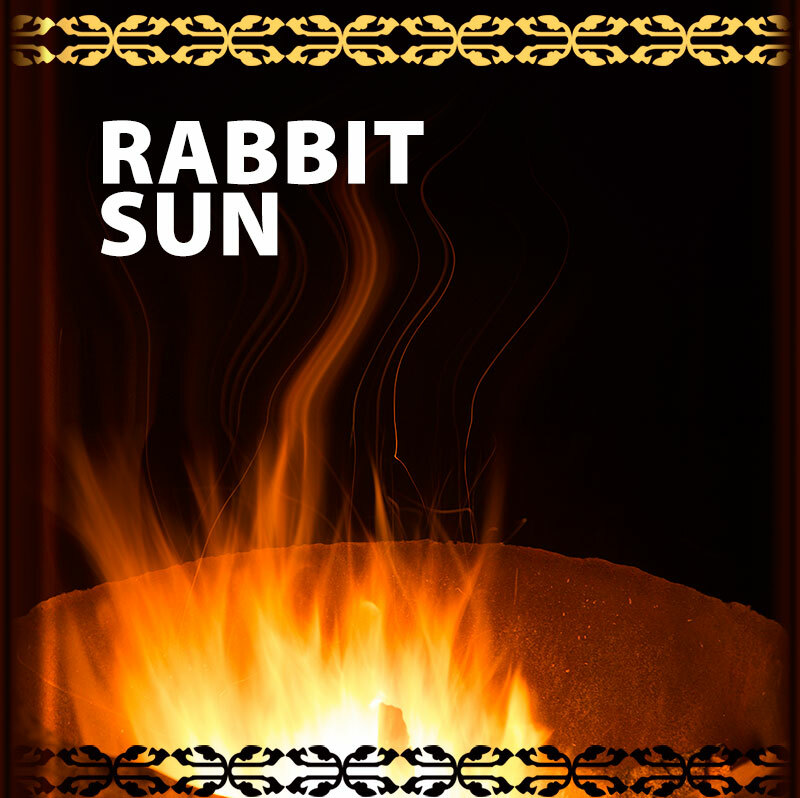 The Rabbit, although he went close, was afraid and kept on passing by the sun, from one side to the other. Manshtinge aka e’shan ahi bi, wa’xthi te a’ta’shan bi Min than i’nan’u, a’the nani’te. Finally, rushing forward with his head bent down and his arm stretched out, he cut the bow-string with his knife. 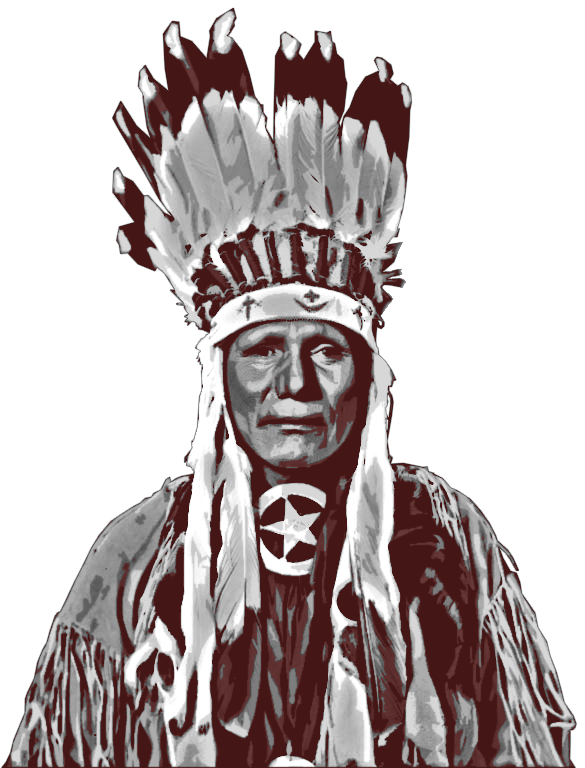 Ki ku’e, tanthin a’tha–bi a ke thu’tan, manhin e’ta anbi, mandekan Ke ma’sa a’biama. The Sun was then free and traveled high in the sky. Ganki Min aka manshi’a’ha a’tha’i a’bi’ama. While setting the Sun free, the Rabbit had the hair between his shoulders Scorched yellow because it was so hot when he bent over to cut the bow-string. Ki Manshtinge aka, a’ba’ku hin than, nanka, than a’na’ka de na’zi a’biama, na’ka’de te a’ta’shan, a’hia e’shan a’hi bi’de, ku’e, mande’kan ma’sa, biama. Ki–ti te a’ki bi, “Kanha! Na’thinge bthin”, a’biama, na’ka’de te na’thinge, bthin. “Tu’shpa’than!” A’bi’ama, na’ka’de aka innathinge xti. From that time on, the Rabbit has had a singed spot on his back, between his shoulders. E’di tan Manshtinge aka nanka than na’zi a’thin a’biama.